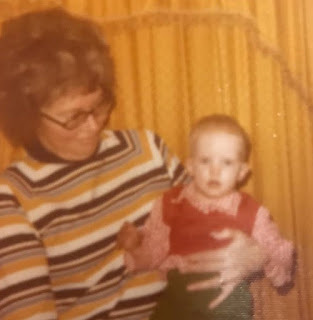 Grandma Dorothy holding me at 5 months of ageIn February, 1974 when my mom took me home from the hospital, she thought she had a perfectly healthy baby. But when her mom came for a visit five weeks later to see her granddaughter, she asked why my lips looked discolored. Grandma Dorothy also noticed I slept a lot, even for a newborn. Mom assured Grandma she would ask the doctor about it during my six-week checkup. Mom took me to the same clinic in Wolf Point, Montana, where I had been born. She and Dad were living in a tiny town called Luster, where Dad worked as a ranch hand. My regular pediatrician was unavailable. A young doctor, fresh out of medical school, examined me instead. Dr. Mattley quickly agreed the bluish tint to my lips was disconcerting and because of it dubbed me a blue baby. ?Her body isn?t getting enough oxygen, which is why her lips and fingernails are cyanotic,? he said. He also detected a heart murmur. An X-ray confirmed a possible heart defect. Following the examination, Dr. Mattley called the clinic in Great Falls, which employed the closest pediatric cardiologist in Montana, 300 miles away. At the age of three months, I had my first electrocardiogram. I also had a second set of X-rays. The cardiologist admitted to my parents that he wasn?t sure what he was seeing. ?There?s nothing we can do at this time. We?ll just have to wait and see. She most likely will need to have heart surgery someday. ?